There is always a sense of excitement before we head to the legendary Mt Panorama circuit. 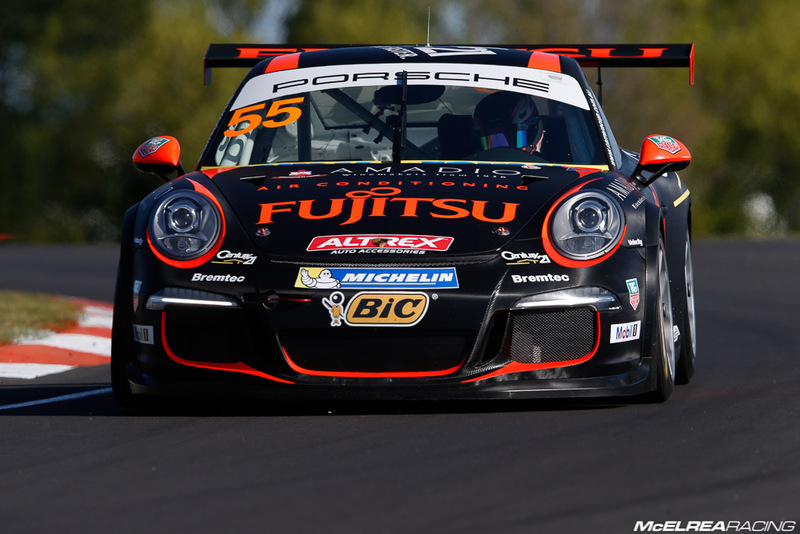 We have had a great run at Bathurst, winning the round in 2011 with Michael Patrizi and again in 2013 with Luffy so we were cautiously confident of another decent result. We are rapt to have won the round with Shae recording his second race and first round win of the season… and what a place to break the drought.!! 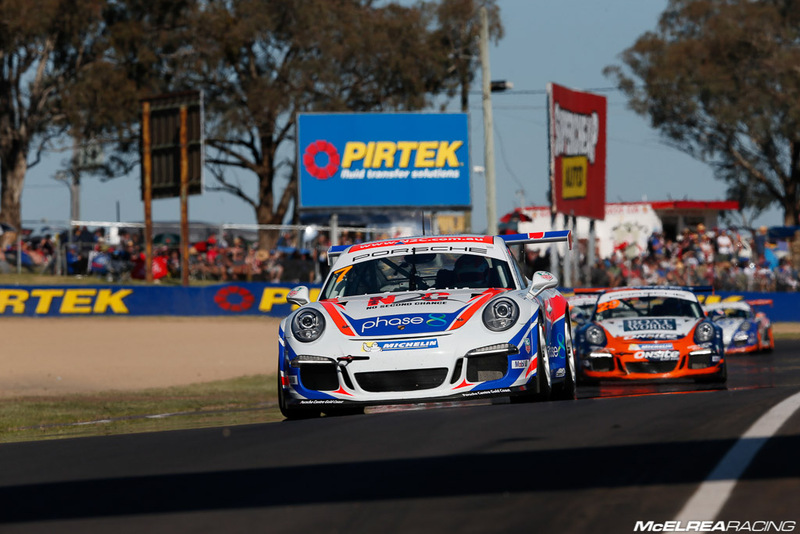 Wallsy just missed out on his second Elite Class podium, Scott Taylor learned plenty, Renee announced her exciting move to the V8 DVS for 2015 and Luffy had the biggest roller-coaster weekend imaginable. After a big shunt in the second practice session on Thursday, the Awesome MR Crew had a very late night (if not getting to bed at all qualifies as a late night..!!) fitting new rear chassis rails, a replacement engine, front suspension, bodywork and a seemingly endless list of miscellaneous parts to Luffy’s No Second Chance Porsche. It was this year’s most extraordinary effort from any team in Australian Motorsport. The expertise, humour, accuracy and attitude of the boys’ epitomises the MR ‘Never Say Die’ attitude. Aside from his Carrera Cup duties Luffy was also set to compete in the Bathurst 1000 with Garth Tander for the Holden Racing Team. Unfortunately their plans were cut short due to a well publicised brake failure during practice… Luffy hit the wall at turn 2 with the damage to the chassis being so severe that the car was retired for the weekend. He was very fortunate that contact with Lowndes decreased the impact speed or Luffy himself might have also been out for the weekend..!! Following his Carrera Cup crash in practice and the incredible overnight repairs by the team Luffy did an amazing job to qualify only half a tenth off pole to start from the front row beside fellow championship contender Steve Richards. Race 1 produced a hard fought 2nd place behind Richo with race 2 resulting in our 6th race win for the season after Russell was penalised for punting Richo out of the lead on the last lap. In race 3 Luffy started on pole, lead the whole race until the last lap when a crazy move by Foster shovelled the leading quartet including Luffy, Richo and Russell into the fence at turn 2. It was heart breaking after all the effort by the team and speed from Luffy to end-up sustaining more expensive damage and no points. A tough weekend for MR, Luff and N2C but we still managed to extended our lead in the Championship..!! Needless to say it was a huge relief for Shae and the team that he finally secured his first round win of the season. 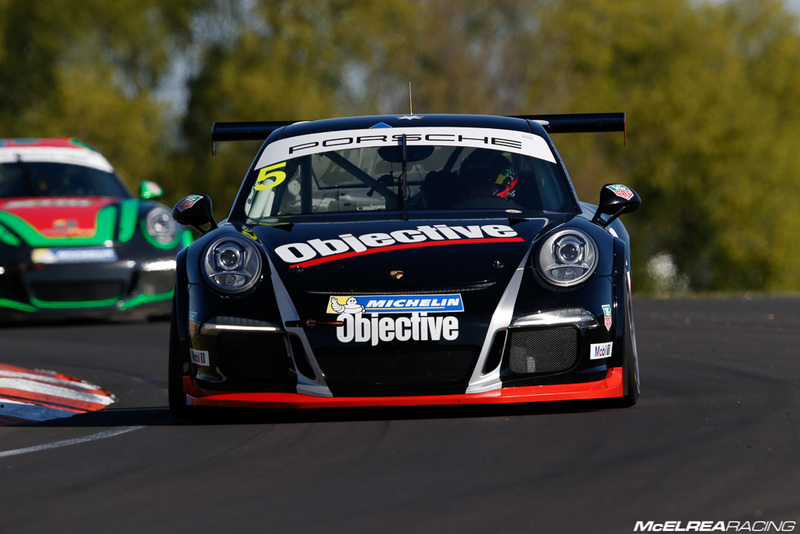 Prior to Bathurst he had been the fastest driver in Carrera Cup without a coveted round win. 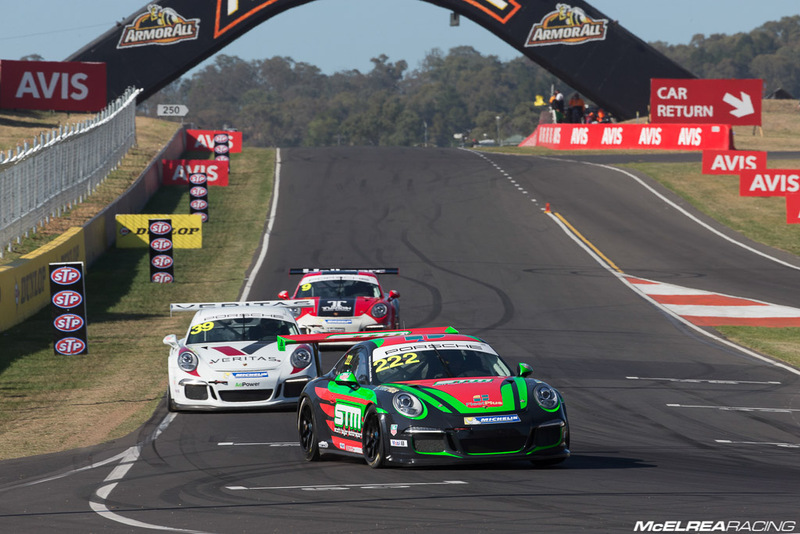 He drove two smart and measured races in race 1 and 2 continuing to learn the daunting and challenging Mt Panorama circuit whilst working with his engineer Leigh Geyer to fine-tune the car to suit his driving style. Showing maturity beyond his years he kept his nerve after the ‘Foster Incident’ in race 3 and lead the pack to take the race and round win. 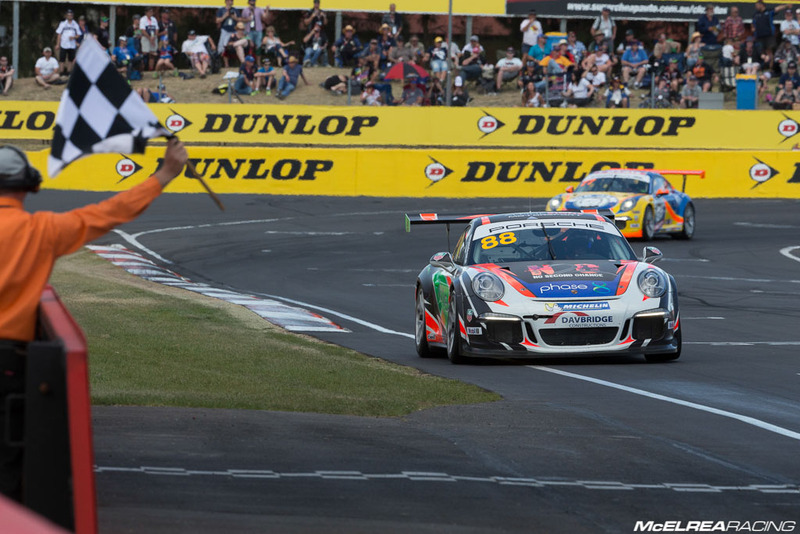 The first 2014 Carrera Cup round win for Shae Davies was great news for him and the team..!! Unlike most Bathurst newbies, ‘Princess’ did a very smart job to build-up her speed over the course of the weekend and keep her car in one piece. Renee consistently improved her lap times over the course of the weekend to end-up-with a very respectable 2:13.79 in the final race on the Sunday morning. 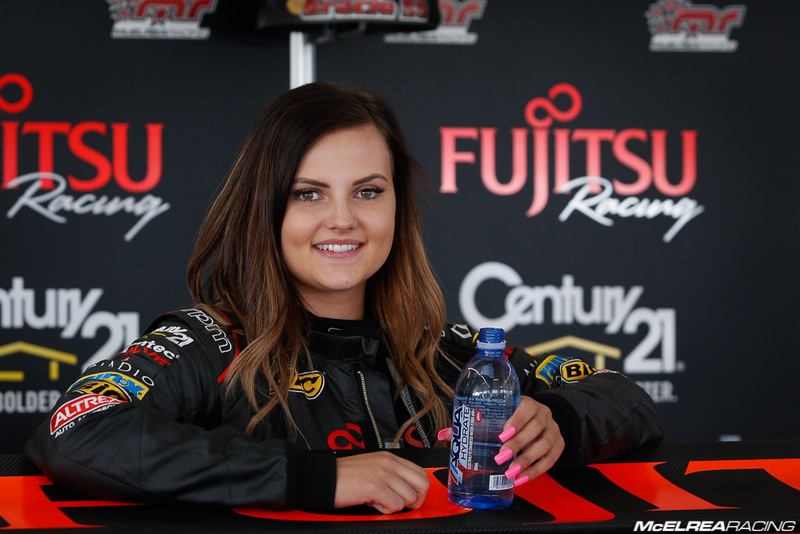 It was an important weekend for Princess with the huge announcement that she will pursue a career in the V8 Supercars and join the V8 Development series for 2015. We would like to take this opportunity to congratulate Renee and wish her all the best on what is guaranteed to be a very exciting career. It has been an honour and a privilege to have played a part of these early stages and it’s been very rewarding to see her growth both as a person and as a racing car driver. Renee built-up speed over the weekend and stayed out of trouble recording her fastest lap in the final race..!! Tony wasn’t satisfied after qualifying 7th in Elite, but we believe he did a good job considering the shortened practice sessions and his lack of experience at the mountain. 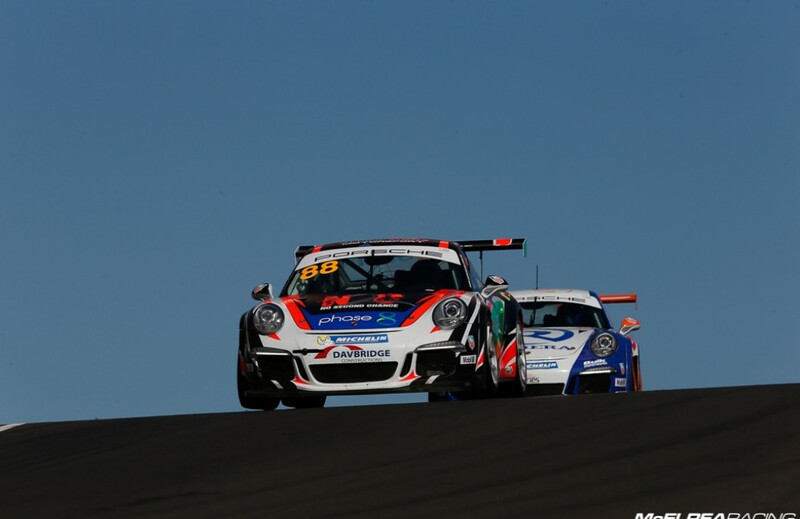 He drove very well to finish 3rd in his class in the first and second races and was on target for his second Carrera Cup podium but race three was cut short and he ran out of passing opportunities missing the podium by a couple of points. We are looking forward to Surfers Paradise in a few weeks as this is where Wallsy picked up his first-ever podium last season..!! Tony Walls put in a solid effort only just missing the podium for the Elite Class. Scotty qualified 9th in Elite in the 23 car field. He had done a few laps around Bathurst back in Easter in his older model so he was reasonably well prepared. He had an eventful first race doing a fantastic job amongst some Elite regulars finishing with the 3rd fastest lap time in his class. In race 2 he was having a great dice with some experienced campaigners which ended when Bergmuller and Samadi tangled and hit the wall with Scotty getting caught in the ripple effect losing the left-front wheel in the process. Another late night for the MR crew and Scotty was back on track to finish an impressive 14th outright and 7th in Elite. Scotty mixed-it with some experienced regulars of the Elite category to record the third fastest time. 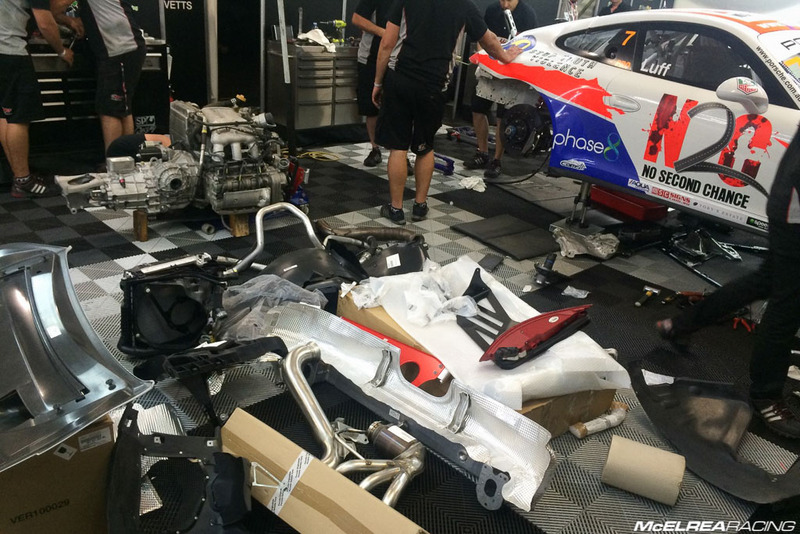 We had the all-nighter fixing Luffy’s car after his massive shunt on Thursday. Then there was the idiotic accident which took Luffy out of the lead on the last lap of the final race… but there is plenty to be happy about and much to be proud of from the weekend..!! Shae Davies finally got to the top step of the podium giving MR a 1st and 3rd outright for the round. 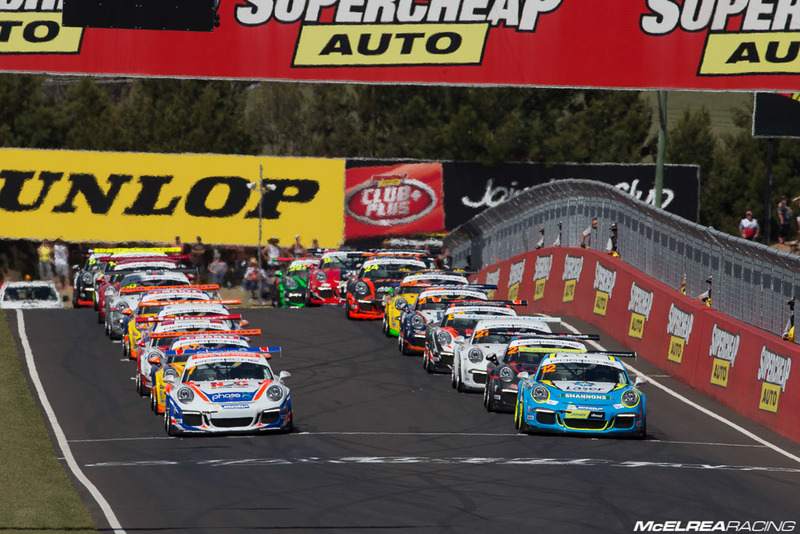 This gives McElrea Racing three Bathurst round wins in four years with three different drivers. Luffy set a new lap record of 2:08.89 and extended his lead in the Championship. Although we have mentioned it already the efforts of the team on the weekend really deserve some more praise. As Team Principal I was just blown away and could not imagine having a better bunch of guys to go racing with..!! In other news we will say ‘Seeya later’ to Princess after the final round at the GC600 in 2 weeks who is heading for V8 powered pastures. Tony Walls will have an exciting announcement on his 2015 plans in the near future and we are looking forward to further developing Scotty Taylor in the Carrera Cup and the GT3 Cup Challenge in 2015. Fingers crossed Luffy can seal his first Carrera Cup Championship in Surfers, but quite frankly if we can’t get it done, we would be almost as happy to see Richo take the spoils. Like Luffy he’s a true gentleman who does allot for the sport and has raced very hard and fair all season, and either way it will be a thrilling finish to an amazing 2014 Championship.